INDUSTRY.co.id - TANGERANG, JULY 14th 2018 – Sky House entered Indonesia’s market in 2017 and is committed to fulfilling the society’s need for quality home. With the integration of green-living concepts and highly efficient designs, Sky House aims to provide a modern, healthy, safe and secure living environment for all parts of the society. Sky House also managed to receive official appreciations in the attempt to fulfill the society’s longing for a comfortable home, as shown in its first project, Sky House BSD+, being awarded as The Best Apartment in South Tangerang by Rumah123.com. “With such experience and recognition, Sky House is your trusted brand for five-star living,” said Fathan Thaher, Strategy Manager of Sky House. Fathan Thaher also added that Sky House also has an Exhibition Center located in Thamrin Nine Complex, Jl. M. H. Thamrin, Jakarta. 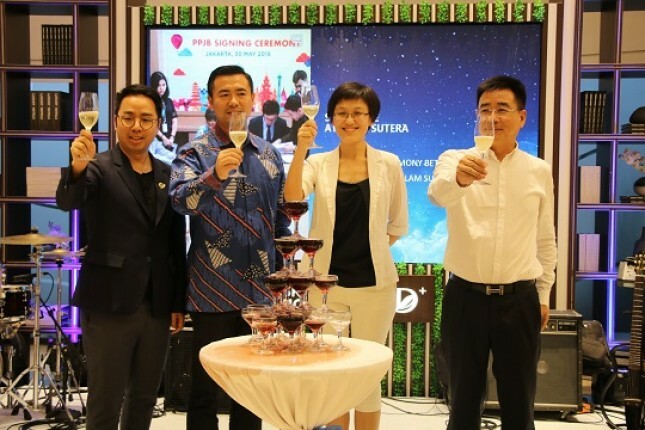 “This is where our current projects and future developments in Indonesia are showcased,” he said during the Rise to New Heights with Sky House event at Sky Club House, BSD City (14/7). The design concept of Exhibition Center asserts Sky House’s commitment to deliver world-class, high quality products and property services. This is reflected through the world map displaying the values of international companies. Moreover, the map of Indonesia at the lobby emphasizes Sky House’s arrival in Indonesia to provide the best for the society. Sky House’s first project in Indonesia was Sky House BSD+, which launched in 2017. This first project is located in BSD City, right beside AEON Mall BSD City. “The launch of Sky House BSD+ is the developer’s strong commitment to launch large-scale projects in Indonesia,” said Johnny, the Project Director of Sky House. “Sky House BSD+ brings the concept of Singapore Living to BSD City, emphasizing designs based on nature alongside international-quality architecture, landscapes, and facilities,” he said. With eco-friendly innovations, stunning landscapes, as well as smart security systems, Sky House BSD+ will make you feel as if you are really living in Singapore. Johnny added that Sky House BSD+ has been greatly welcomed by the society. “This can be seen from the sales that has reached over 1.200 units since the day of launching in December 2017,” he said. This achievement shows that Sky House BSD+ is considered capable in fulfilling the society’s longing for a quality home with a strategic location. Sky House has now acquired a new plot of land in Alam Sutera for a new project. The project will be based on a modern community concept that emphasizes convenience like never before. “Sky House Alam Sutera+ offers the dynamic lifestyle sought after by today’s youths while also catering the needs of mid-sized families,” said Fathan Thaher, closing the statement. Sky House BSD+ will be built across an 8.3-hectare land, and it will be consisted of Studio units (20 m2), 2 Bedroom (48 m2), 3 Bedroom (68 m2), and 3+1 Bedroom units (85 m2 and 120 m2). Sky House BSD+ is located in the Central Business District (CBD) of BSD City with integrated modern infrastructures. Plus, with AEON Mall BSD City right beside the project, Sky House BSD+ is the ideal residence capable of fulfilling all your daily needs. Sky House BSD+ offers you the first seven-layered garden in Indonesia. With a 4.6-hectare residential garden and a 1.7-hectare Sky Garden, you will be able to enjoy a life surrounded by the gorgeous nature. The flourishing nature does not stop there, because BSD City itself has 400-hectares of greeneries as a healthy and comfortable living environment. Safety is the issue of utmost importance in any residence. Hence, Sky House BSD+ comes with a reliable security system, such as the 24-hour CCTV monitoring and security services, as well as various cutting-edge features such as video intercom and emergency button to provide you with a worry-free life. The units in Sky House BSD+ are semi-furnished with quality products from renowned brands such as MODENA, TOTO, SCHNEIDER, or other equivalent brands, ensuring a long-lasting usage as well as satisfying designs. Additionally, the kitchen also comes with the essential counters as well as cabinets, and the bathroom is already sufficient to cater your needs. Sky House BSD+ integrates nature and modern living, so technologies are cleverly utilized to promote convenience and security; examples include Wi-Fi coverage within the premise, the access card system, as well as direct drinking water system at public area. Sky House BSD+ is loaded with numerous facilities for all-ages, such as children’s playground, a 1.2 km jogging track, yoga area, badminton and tennis courts, a 1.600 m2 adult swimming pool, a 500 m2 kids swimming pool, as well as indoor and outdoor gymnastics area.